Welcome to another guest blog edition of Watch Out. Today I’ve got author Jody Vitek here to represent her fellow authors. Thank you for being my guest blogger on Watch Out this week. Jody is part of a wonderful anthology called Love In The Lakes. I’m going to hand over the seat to Jody.. Roadside Love in the Midwest Fiction Writers (MFW) anthology Love In The Land Of Lakes, is the first short story I’ve written. I had fun writing this story because it involves escaping to one of Minnesota’s beautiful lakes and a resort. More than likely, if you read the anthology you will want to escape to one of the many lakes in Minnesota. There are cabins you can find to rent, resorts you can find to stay from a weekend, to a week at a time, or simply enjoy one of the over 10,000 lakes in our beautiful state. It is an annual tradition for my family to go to a northern Minnesota resort for a week and share a cabin with my husband’s family. We have been making this annual trip for over 18 years and I hope it continues, but that’s another story. It’s been fun to watch the kids grow and change with each year. Memories are made and captured for a lifetime. The most memorable event we share as a family is the year we rented the resort’s pontoon boat to spend the day on the lake. My brother-in-law rented two personal water craft and at one point we stopped to ride the personal water craft in a less trafficked area where it would be easier to switch riders using the pontoon as a loading and unloading area. One of the personal water craft sucked up the anchor rope into the motor of the personal water craft, causing the personal water craft to seize. We now had two haul the personal water craft behind the pontoon back to the resort. As we returned, the weather changed from a beautiful sunny day to dark clouds and rain. Thunder and lightning soon followed and here we were, on a large body of water on a metal pontoon boat. Lightning flashed in the sky and rough waters had waves crashing over the front of the boat. This scared the younger children and most adults were a little worried, because of the lightning and metal of the pontoon boat. First rule of thumb you learn living in Minnesota, you don’t go on a lake when there’s lightning or be near anything that is metal. The problem, we didn’t want to stop and get off the boat. We had to keep going to get back to the resort. An argument ensued over whether or not to return the personal water craft to the rental place or to go back to the resort. Going back to the resort won. My daughter was six months old, in a little bouncy seat chair, on a metal pontoon boat, in the middle of a storm. Needless to say, I was a little nervous. Not happy with my brother-in-law for wanting to go return the personal water craft. We made it to the resort without incident and docked the pontoon boat. They returned the personal water craft after the storm passed. The family looks back at this memory and can laugh about it. It may not have been funny at the time, but we now share in the laughter of a wonderful family memory. Do you have any vacation memories you would like to share? Minnesota is the land of 10,000 lakes, and just as many love stories. 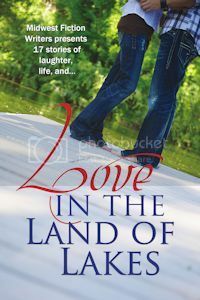 Love in the Land of Lakes brings you seventeen of these stories, from two childhood sweethearts connecting on the end of a dock on a warm summer’s evening, to a city boy’s chaotic weekend at his girlfriend’s primitive cabin. We bring you the story of a savvy horse who leads her owner to love in post–Civil War farm country, and the haunting romance of an ageless gambler who inhabits a historic riverboat and charms the boat’s new owner. A kaleidoscope of sunshine, snowstorms, and thunderstorms grace our contemporary, mystery, historical, and paranormal stories as the authors of Midwest Fiction Writers spin lovely romances that will send you drifting into happily ever afters. Bobbers ‘N Bait – The evocative marketing gimmick at the new bait store in town has the fishing outfitter all hot and bothered. A Cut Above the Rest – Rachel knew that a simple haircut had the power to change someone’s life. What she wasn’t counting on though, was how it would change hers. Lira & Gavril – A dilapidated riverboat brings together a passionate historic preservationist and a man who called it home during the Victorian era. Lake Dreams – Olivia had her life all planned out. All except for that one impulsive night with her childhood crush. Can he convince her the result is worth the risk? Hook, Line and Stinker – An LA makeover artist comes home to Minnesota and must use all her skills to tame a wild man. Snowbound – Caught in a snowstorm, the last person she expects to need her help is the man she loved but lost to someone else. Dancing in the Moonlight – Anna Thorstad never imagined reopening her parents’ lake cabin would also open her heart to love again. Hooked – An avid outdoorswoman takes her city born and raised boyfriend for a chaotic weekend at her family’s primitive cabin on the lake. Henrietta’s Man – A savvy horse carries her Civil War-torn soldier north in search of healing and a future. Coming Home – A young widow’s faith and courage are tested when she falls in love with her husband’s best friend. Her Stranger – Each night a stranger comes to Rachel’s cabin door. What is it that makes her fall into his arms? Lake Secrets – A weekend getaway at the scene of the crime has Elly struggling to keep a secret from her best friend. Unwrapped – Movie star Sloan Leighton sells love; she doesn’t believe in it. Then one frozen midnight on the shores of Lake Superior, everything changes. The Bouncing Bobber – Will a budding romance, sidetracked by youth and ambition, be what it takes to lure Jacob and Nate back into love’s net? What’s Up Dock? – Sophie’s handsome new neighbor is burying body bags in his garden. But he’s afraid of raccoons—how could he be a killer? Wind from the Lake – Wishing on a star? Alien contact? When childhood friends Connie and Hank meet again, they don’t need to believe in anything but each other. Roadside Catch – She swore off relationships with doctors, until one finds her injured on the roadside and has her rethinking the possibilities. Thank you for having me hear today Savannah! I may have started celebrating the green holiday a wee bit early, as I just remembered I was your guest today. Being a part of the MFW anthology was a lot of fun and if the group decides to put together another book, I will be there to participate. I’m sure we all have many things about our vacations to laugh about after the fact. My daughter and I reminisced lately about the fact on camping trips bad things always befell my cakes. Yet I always made a cake for camp trips. One got covered in bees and I even had to throw away the pan. One got left in a cooler we forgot to drain and we could pour it out of the pan. Another had something fall out of a cupboard in the middle of it before I even took it on the trip. I’m just using that incident in a book now. At the time I didn’t find any of what happened to be funny. Now I see the humor. Thanks for stopping Roz. I love the cake stories! With so many of them, I would think it only right for you get the cakes in a story. I believe a well rounded person is able to either laugh at the moment or later after the recovery period. A nice memory; my family doesn’t take vacations together, but I did have one gathering with my children and grandchildren. We haven’t done that often enough, and I think it’s time for a new gathering. I wish you much success with your writing career. I don’t have anything as exciting as that to say about my holidays. Glad you came out of it all right! Thanks for coming by Jenny. You may not have anything exciting to say about a holiday but I’m sure moving from England to Spain has some stories of its own. Thanks for visiting Stan. If memory serves me correctly Stan, you have a very large family and I could understand how difficult it could be to get everyone together. With that said, you need to make it happen more than once in your lifetime. I’m so impressed with how quickly a group of writers could put together this anthology of short stories. Well done! It was surprising how quickly things happened. But we had an amazing team working to put it together. Thanks for stopping by. Ah, Jody, the stories from the lakes! Anyone born and raised in Minnesota has them, don’t they? My family camped and stayed in cabins all the time growing up — in fact, we did the extended family camping thing, too, we just all stayed in tents. Our favorite campground was one where they offered horseback riding along with other activities. My grandpa always called it Horse Potato Park — and that’s where we wanted to go every year! I remember muddy clothes, old-fashioned outboard motors, tiny sunfish, leaky air mattresses, thunderstorms while tent camping: yup–I really enjoyed your story; it brought back good memories! I want to go camping where you went! Horses sound fun. Thanks for coming by and sharing your stories, Liz! That’s quite the vacation story, Jody. All’s well that ends well! Keep up the good work with your writing. Thank you Valerie and thanks for stopping by today.